Limited Time Change Management Special Offer! The just-published 500-page 2016 authority reference guide by the American Society of Civil Engineers: Construction Contract Claims, Changes and Disputes Resolution. This book covers claims from A-Z, including recently added chapters addressing design-build and alternate delivery methods, bonds and liens, and the role of insurance on claims. 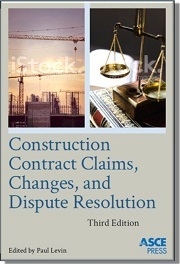 Written by 21 contributing experts with a diverse skillset in construction law and consulting, the guide provides the reader with best practices for identification, notification, documentation, delay and cost analysis, pricing, negotiation and resolution of claims and changes. This information-packed reference guide includes separate chapters on delays, acceleration, CPM schedule analysis and an exhaustive 40-page section on pricing. The Construction Claims Advisor Newsletter. Written by construction attorney Bruce Jervis, this exclusive newsletter reports twice-monthly the outcome of pertinent construction boards and court cases, including copies of the opinions themselves. There's no better way to avoid mistakes than learn from those of others. Recent studies show that different owners, public agencies and contractors can have different win/loss percentages. Those that understand claims and take the proper steps to manage them will more likely settle claims before litigation, as well as persevere in court. Access to the Construction Claims Advisor Back-Issue Library. The Library includes over 2,000 case summaries since 2003. Search on topic, party, court, etc. and see how others fared and why. Make these case studies for your team. For example, according to a study by CFMA in September 2015, Army Corp of Engineers projects, contractors prevailed only 11 percent of the time, and at least partially recovered in only 38 percent of the time. Cases before the GSBCA were settled in favor of the contractor 63 percent of the time and split another 13 percent while cases before the ASBCA were almost the reverse. So before you make a decision on appealing a case, it may be worth the trouble to search our database, for example — is the Total Cost method still viable (yes), is Eichleay still used for home office overhead (under limited circumstances) and is notice required to pursue a claim, even if the owner was aware of a problem (depends on the jurisdiction). If you have a claims question and you can't find the answer on our website — send your question to us and we will find it for you. For less than $25/month, Construction Claims Advisor is a no brainer. Just one tip from the timely case studies can save you thousands, if not hundreds of thousands of dollars, by being on the right side of a claim. Plus you have at your fingertips the numerous on-demand webinars and reports that recently sold for as much as $199 each Order your subscription today! Take advantage of this special offer today to receive your personal copy of the just-released book — this is a limited-time offer to celebrate the release of this third edition. First published in 1977, over 10,000 copies have been sold over the years helping numerous contractors, owners, consultants and attorneys understand, manage and successfully resolve contract disputes. *Includes free shipping to continental US address. Shipping expenses outside the continental US will be billed separately.